CROWN Detailing & Car Wash has a detailing package to suit every need and occasion. If we don’t have a package that works for you, let us know, we’ll custom make one just for you, starting, as always, with our famous hand wash & chamois. DMAX Detailing & Car Wash helps you Drive Proud. You are a valued Customer and we look forward to seeing you again soon. We are ready to get your car back on the road looking like NEW! We have the perfect, super quick cleanup to get you back on the road quickly & Refreshed. The “Refresher” works great as a weekly clean up, keeping your vehicle from catching the “ickies”. Expect to be back on the road in approx. 30 minutes. Very similar to the “Refresher” just more thorough. The “Bronze” package is a great monthly clean that gets into a few more nooks & crannies to keep your vehicle fun to drive. This package takes approx. 1 hour. The perfect detailing package to get while you are at one of our dealerships having other service work done. Our Service Special is the perfect compromise between speed, price and quality. The Service Special was created to be your “First date”, “Graduation”, “Going to a wedding”, “The in-laws are coming to visit”, “Picking my boss up at the airport”, “Just came home from camping” detailing package. Very thorough cleaning, gets you back on the road in approx. 2.0 hours. Appointment is not required, however making an appointment will ensure that your vehicle is done when you need it to be, not when the rush of other vehicles allows it to be. 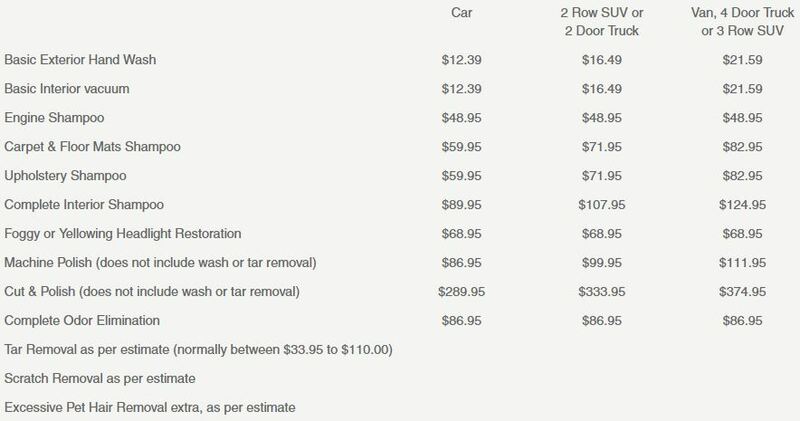 Other detailing centres charge between $135.00 to $155.00 for the same amount of work. The BEST, Interior Only, vehicle restoration, level detailing package in Winnipeg. The DMAX “Silver” level reconditioning package restores the interior of your vehicle to “like new” condition. Due to all the moisture that ends up inside your vehicle from all the shampooing, we prefer to keep your vehicle overnight to ensure that your seats & carpets are completely dry. However, if you do require your vehicle back on the same day, we can do that, we will simply show you how to ensure the carpets get fully dry without any issues. The BEST, all inclusive, vehicle restoration, level detailing package in Winnipeg. The DMAX “Gold” level reconditioning package not only restores the interior of your vehicle to “like new” condition, it adds a shine and a protective layer of polish & paint sealant to the exterior as well. Like aging a fine wine, this package takes time. Whenever possible, when performing this package, we prefer to keep your vehicle overnight to ensure that your seats & carpets are completely dry. However, if you do require your vehicle back on the same day, we can do that, we will simply show you how to ensure the carpets get fully dry without any issues. The machine polish can remove certain marks & scuffs, however it does not remove scrapes or scratches in the paint. We can remove many scrapes & scratches for you at an additional charge & would be glad to come out & give you an estimate for that. The Dilawri business philosophy is team oriented. We have a slogan: ‘Our team beats with one heart.’ It’s a philosophy we talk about all the time. And, we treat every customer like an honored guest in our own home. Those two things are the backbone of the way we do business. Copyright 2016 Crowndetail.ca - All rights reserved.